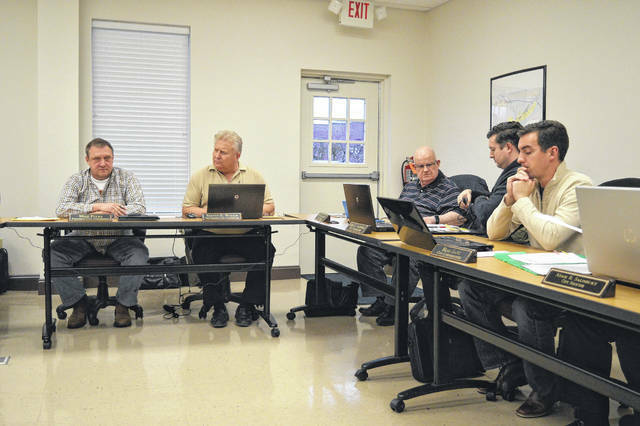 Gallipolis City Commissioners discuss city water ordinances during a Tuesday meeting. GALLIPOLIS — Gallipolis City Commissioners voted unanimously to tighten regulations against the vandalism of water access points connected to city waterworks Tuesday during a special commission meeting. The ordinance creates a section within city law labeled as section 558 “Tampering with water and sewer service prohibited,” according to Gallipolis City Solicitor Adam Salisbury. “That is an ordinance that will allow us to prosecute criminally anybody that opens, closes, adjusts, interferes with a fire hydrant, valve regulator gauge, gate, disk…or other regulator, operating or measuring device, lock or appliance in or attached to the wells, tanks, reservoirs, conduits, pipes, main service, pipes housing or other apparatus owned by the City of Gallipolis,” said Salisbury. According to Gallipolis City Manager Gene Greene, the city has had trouble recently with residents cutting locks off water apparatuses to return water to a residence. The city had been shutting off service to areas that had failed to pay water bills and residents were reportedly vandalizing water or waste water equipment to return service. Previously, the city did not have an ordinance like this. The solicitor said the ordinance is similar to a state statute. The state regulation though apparently did not elevate its penalty if an individual was found convicted of the same crime more than once. Commissioners decided last year to hold property owners responsible for water services and bills for individual properties as officials were finding it difficult to hold tenants accountable as they reportedly dodged water bill payments. Greene had previously said if a water bill wasn’t being paid, it wasn’t uncommon for an individual to move properties or register service in another family member’s name.